Genesis FC had over 950 people at the Gibraltar Trade Center on Saturday night. 18 fights in all for the night, and almost half of them were title fights. The referees in charge of the action and the safety of the fighters were pro fighters Chuck Mady, Ben Lagman and Scott Bickerstaff. On the mic, pumping the crowd and introducing the fighters: Phil “The Voice” Davey. Judging the action (including a 5-round decision for a title cheap nfl jerseys belt) were FightMichigan’s own T.J. Corwin, Nate Patrick, and Rob Ross. If you weren’t there you missed out on some awesome and fights. Good thing we took notes! Keep reading to find out who kept their belts and who’s gonna have to try to get theirs back! As always, we apologize if anyone’s name is spelled wrong. Please let us know in the comments, and we’ll get it fixed. No. It’s not a typo. 5 seconds. Winner and STILL CHAMPION: Shamir Garcia by unanimous decision 50-45 after five crazy, knock-down, drag-out rounds! 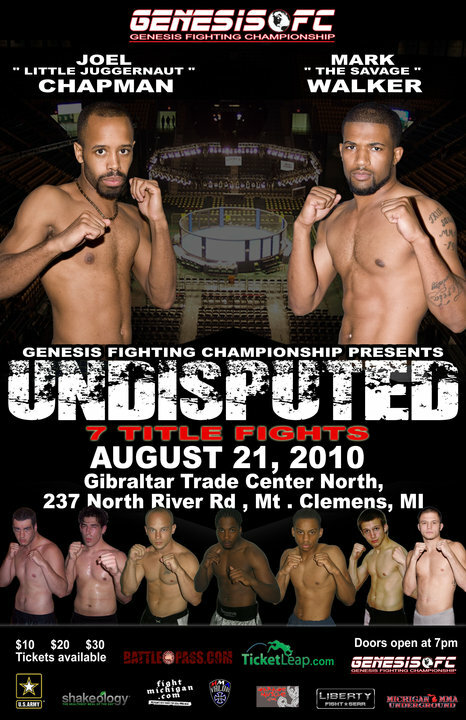 Tagged Aaron Angelbrandt, Billy Garrison, Billy Ward, Bobby Tucker, Frank Thomas, Genesis Fighting Championship, Jacob Berghuis, James Grey, Jerry Peace, Joel Chapman, Josh Lawrence, Kris Lusch, Mark Hassmiller, Mark Walker, Nick Niforos, Phil "The Voice" Davey, Rob Taylor, Shamir Garcia, Theo Toney, Tim Jenny. Bookmark the permalink. I would like to thank Fight Michigan for all the hard work they are putting into MMA here in our great state! Also i would like to thank the fight teams for bringing their bad boys out to show the Mt. Clemens crowd what real MMA looks like! Four Aces, H8 squad, Coopers Gym, Mash Fight Team, Scarred MMA, Mady’s Martial Arts, Absolute Kombat, Team Savage, Gracie Bjj port huron, Stars & Strikes mma, Monroe MMA! I would also like to thank the staff for keeping the fighters safe and helping out with every aspect of the show! Ben Lagman, Chucky Mady, Scott Bickerstaff, Missy Simons, Greg Parris, Jordan Fejedelem, Terry Bertrand,Rob Ross, Phil Davey, Shannon Hale, T.J. Corwin. Sponsors: Beachbody,Shakeology,Fight Fuel, Liberty Fight Gear, Excaliber Tattoo, Relax Inn, MMA Unlimited, Garage Muscle, Jamels Brazilian JJ, Boyland NISSAN. Last but not least I would like to show a ton of love to all the Michigan,Ohio and Canadian fight fans that came out to cheer on the fighters! the New Genesis Fighting Championship SUPERFIGHT CHAMPION!! !